I am so excited to be part of the Homeschool Review Crew again for 2018. This is my third year on the crew and it’s been a wonderful experience to keep me motivated and blogging. I know you all have enjoyed hearing more about great homeschool products and our family has enjoyed reviewing them for you. Looking forward to bringing you even more this year! First of all, we have been given the privilege of reviewing for Heirloom Audio Productions again and bringing another G.A. Henty novel to you guys with Wulf the Saxon. In the past years, we have reviewed three other audio dramas by Heirloom Audio Productions, including Beric the Briton, The Dragon and the Raven, and Captain Bayley’s Heir. These are always the first to get packed when we get ready for a road trip! Over 2 hours long, the Wulf the Saxon audio drama is sure to please listeners ages 6 and up! 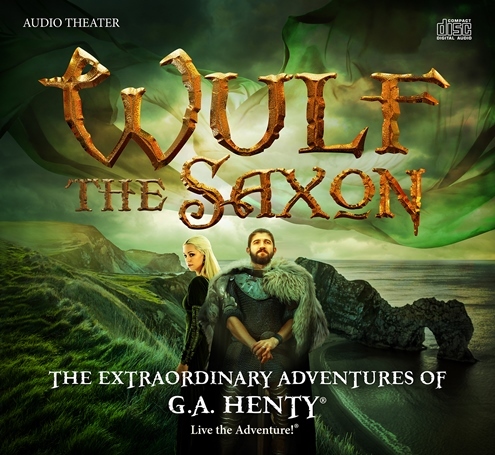 This audio drama is adapted from the book, Wulf The Saxon, by G.A. Henty. Through these audio dramas, you are free to “Live the Adventure” by building character in bringing the stories to life. Wulf the Saxon takes place in 1065 while Edward the Confessor is King of England. Wulf and his friend find themselves shipwrecked at Normandy during the struggle for England. This product is available in an Instant MP3 Download for $24.97 or a Single Pack with the CD set and MP3 Download for $29.97. Four packs and Twelve Packs are also available if you need more than one copy. Having reviewed for Heirloom Audio Productions previously, we had high standards for Wulf the Saxon, and of course it didn’t disappoint. Now whenever a product from Heirloom Audio Productions arrives, my kids run off with it, never to be seen again until it’s completed. I managed to snag the CD set back so I could finally listen to the set! We often will let audio dramas run in the background while we do arts and crafts or play quietly. As always, the sound effects make it seem like you’re right there with the characters! It is so well down that you can feel their emotion and almost taste the salty sea air! The background truly makes this audio drama come to life! I really like the Wulf the Saxon CD set. My favorite character is Wulf because he’s adventurous. My favorite part is when Harold and his men get shipwrecked and then captured. Wulf was able to escape and has to go tell the knights to help get Harold. Listening to the CD set allows me to be able to listen to books while doing other things. I hope that Heirloom Audio Productions produces more of the G.A. Henty audio dramas. For more information, please visit the Heirloom Audio Productions website. You can also find out more on Facebook, Twitter, Pinterest, Instagram, Google+, and YouTube. You can also find out more by clicking the banner below to read more reviews on this product and others by the Homeschool Review Crew.